For some dogs a harness is better than a collar. Particularly when out and about with your dog. 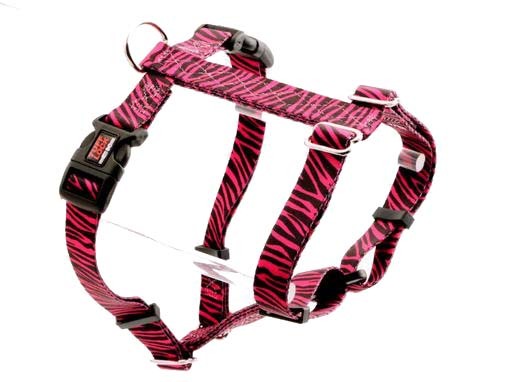 We provide a Step In Harness and Figure H Dog Harness with the Premium Tuff Lock quick-release buckle for easy on/off. Connected by cross-bars on the pet’s back and under its chest our harnesses are fully adjustable. Your Dog steps into the two webbing loops with its front paws. And then you clip it shut with the quick release buckle now on the dogs back. Multiple dog harness sizes – whether Step-in or Figure-H harness for your dog – gives you full control of your pets. As well as giving the pet the feeling of extreme comfort and safety beyond the walls of your home. Contoured buckles, sturdy yet comfortable webbing, and hardware that not only has ‘catwalk’ appeal but will also endure wear. Weather and rough play is what makes our products the most desired personal pet-ware on the continent. All of our products, including Premium Tuff Lock dog harness, have an unconditional lifetime guarantee. Even if they are chewed in half by on overabundance of enthusiasm. That’s how much we believe in our products. 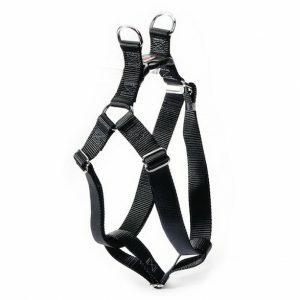 Premium Tuff Lock dog harness is hand sewn and made from tough, high quality nylon. Because every one of Premium Tuff Lock dog harnesses, dog and cat collars and leashes are completely, and proudly, made in California we can ensure the highest quality in each item, both in composition and construction. Premium Tuff Lock selection has well over 100 styles and patterns to satisfy the heart of the most fashion conscious pet. Solid colors, checks, modern and classic patterns and, for the ultimate style sentient pet. Moreover there are designs for every season, Christmas even Halloween.